Identify sales opportunities, understand what inventory is needed and where, forecast your future sales, inventory, and space needs. Track, react and respond to sales events correctly, answering the questions: Did the customer behave as expected? Did you maximize your gross margin? Did you make money? It’s all in the data. The question is how to separate correctly and analyze the data to provide actionable and profitable results. Data Profits’ patent-pending process breaks your Point of sale data into categories which are then run through fourteen proprietary algorithms, resulting in the optimum and most accurate forecast. 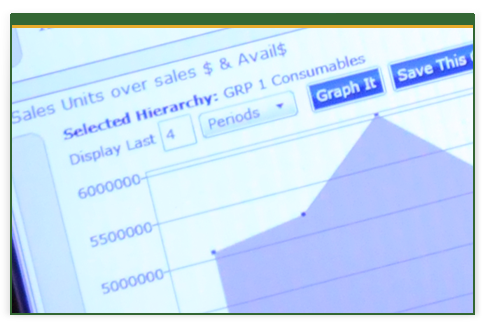 We connect and store in our data warehouse the data from your disparate systems, like merchandising, Point of sale, warehousing, and users, to create the iKIS 5.2 business intelligence-based sales and supply chain solution. A collection of Wizards and programs automate many features that legacy software leaves open to manual error. This isn’t a “black box.” You can define as much or as little of the forecasting and supply chain processes you want to handle, or leave for the system to manage. In stock, service attained, lost sales, close outs, and promotions are all recorded and reacted upon. Seasonality, sales rate (slow movers, rapid risers), customer trends, and sales events are all measured, recorded and responded to in this solution.